I was recently feeling that there wasn’t enough science in my life (I don’t know, it was a feeling) so I did what I usually do when I want more of a topic–I found a book about it. Specifically, I went to the library and looked up “astronomy” in the Dewey Decimal system and went over to that shelf to see what I could find. 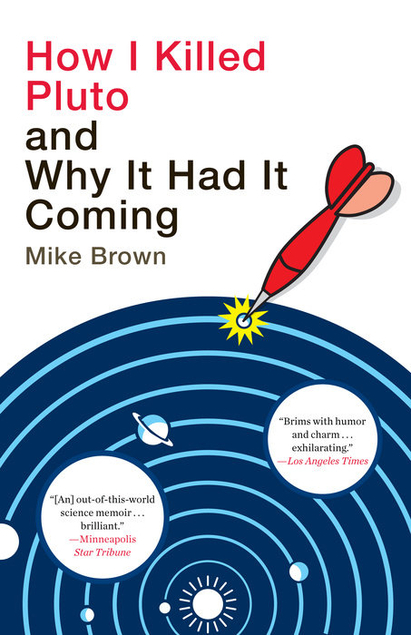 And so I stumbled onto How I Killed Pluto and Why It Had It Coming by Mike Brown–and it was excellent. Mike Brown is the astronomer who found a large object beyond Pluto, igniting the debate (or at least, seriously heating it up) about what exactly a planet is, and whether Pluto qualifies. His book is a kind of astronomy memoir, about his work looking for large objects beyond Pluto, in the Kuiper Belt. The one that caused the controversy, nicknamed Xena and eventually named Eris, wasn’t the first one he found, so the story is something of a journey through near-misses, other discoveries, Mike’s own engagement, marriage and birth of his daughter along the way, and finally the great Pluto controversy. It was very readable throughout and really fascinating. I’ve been interested in astronomy for a long time, so it was very cool to read about what an astronomer making exciting discoveries actually does (a lot of staring at pictures of stars looking for something that moved, as it turns out). Mike had a clear fascination with the stars and planets that I understood and enjoyed reading about. He made his various discoveries both understandable scientifically, and exciting adventures. He also offers a front-row seat on the Pluto controversy. I was actually taking a college astronomy class when it all hit, so I had some familiarity with the whole thing. My professor at the time held the same view as Mike, and was pretty convincing–basically, that if you’re going to set a scientific definition for “planet,” either you exclude Pluto or you have to include a hundred other objects out there. Letting Pluto go seems like the lesser of two evils. So I was already primed to go along with Mike here, but he lays out a good case and seriously discusses each viewpoint. If you have some interest in astronomy but don’t want to wade through a dry textbook, I highly recommend this one. As I said, very readable, a lot of fun, and a healthy dose of science mixed into the enjoyment. I hadn’t seen this… now on my priority reads! Thanks!